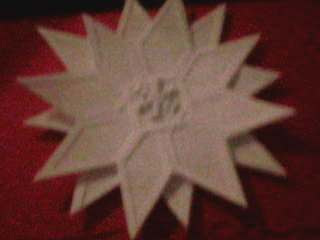 Create Embellish Adore: Star flower?? Pointsettia ?? This is not a good scan, I am sorry..
Let me tell you, this card, has got TIME TIME TIME involved with it. One night its using the two size tag punches to punch my tags out, the next night its gluing the tags to the mulberry paper and cutting it out. Then putting the card together. I love the look but man talk about TIME involved. I have someone who is interested in ordering these for their Christmas cards, and I am dreading making them, so I am starting early and trying to figure out what cost is going to be. I love the look- dont get me wrong, but man o day, they are a work out!